If dressing up is the best part of Halloween, coming up with a good costume is the worst. Even though it falls on October 31 every year and even if you spend weeks thinking about it, we've all been guilty at one point or another of waking up on October 29 with nary an idea of what we've going to be. 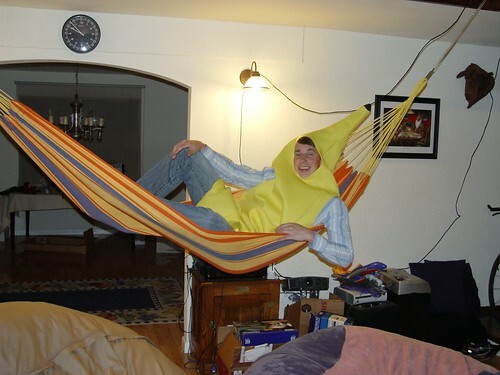 In the end you find yourself stopping in at one of the multitude of costume stores and grabbing something off the rack and spend all night wondering how you ended up in a situation where you were a banana for Halloween. It only gets more complicated if you're in need of a couples costume. Not only do you have to think of a costume idea, but the other party has to sign off on it. Do you really want to spend the lead-up to Halloween negotiating the terms of a costume? Of course not. Lucky for you, we've already gone over the question of what to be for Halloween and have five cheap and easy options for you and yours. Do you really want to be a pair of bananas? That's what we thought. It's a safe bet that this year's big pop culture costume theme is going to be Breaking Bad, and we fully expect to run in to 27,000 duos pretending to be Walter White and Jesse this Halloween. Don't be those guys. Instead, embrace your inner meth head and dress up as Skinny Pete and Badger. They are the "2 best hit men West of the Mississippi" after all. In life, we all need that friend that we can count on through thick and thin. When you've had a year like Paula Deen, friends can be in short supply. Luckily for her (and you), there's one thing she can count on to never leave her side: butter. Yes, butter has feelings too. "Clark Kent Getting Ready to Become Superman" is the king of the lazy costume world. Batman isn't far behind. If you're going to go that route, why do Superman vs. Batman when you can go the opposite direction? Be lovers, not fighters. It hasn't been the best season for Matt Schaub and fans have become increasing hostile toward the Texans quarterback. You've seen the video, right? Now, you might not be able to get in to a few places carrying a blowtorch, but you probably don't want to go to those places anyway. How much fun can you have without a blowtorch? Whether you stand with Wendy or roll with Greg, the one thing we can all agree on is that it's going to be a long race. So long, in fact, that you can easily reuse this idea next year. That's the kind of forward thinking, money saving idea we could use more of in politics. You two are real patriots. Salute.